Oh, what a night! 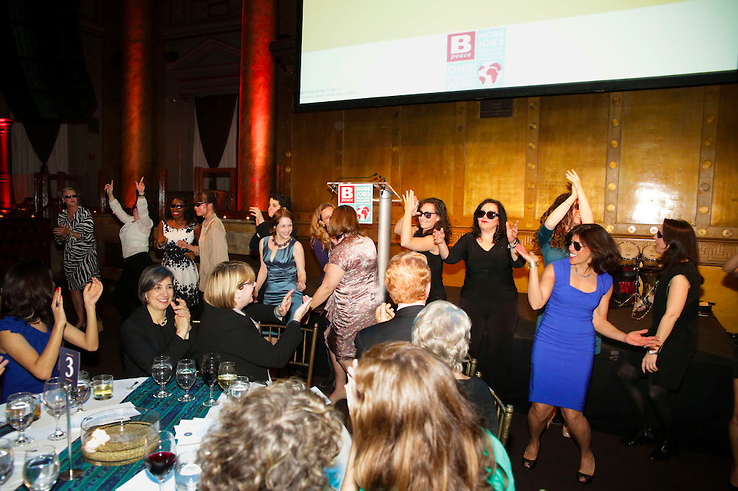 From the regal ambiance of the historic Capitale, venue for this year's annual Bpeace Gala, to the post-dinner "Happy" flashmob, full of Bpeacers showing off their best dance moves, the 2014 Gala was truly a night to remember. On the afternoon of May 1st, excited volunteers and staff bustled around the event premise to set the stage for a perfect evening. 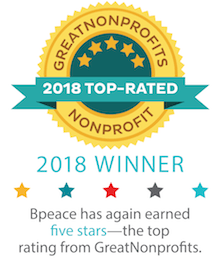 This year’s theme was “Passport to Peace.” Guests took a journey to Afghanistan, El Salvador, Guatemala and Rwanda all while being fabulous in downtown Manhattan and supporting Bpeace’s mission of creating jobs in these conflict-affected regions. A silent auction and cocktail hour kicked off the night, jump starting everyone into high spirits. Bpeace CEO Toni Maloney welcomed the 200 guests. Later, Board Co-chair Kate Buggeln emphasized the connection among jobs, opportunity, and the “pursuit of happiness,” with a serious lead-in to a surprising treat. Fast Runner entrepreneurs and their employees all contributed to a video set to the popular Pharrell song, “Happy.” They did their best “happy dance” around offices, conference rooms and production areas demonstrating exactly what Bpeace stands for—happiness through job growth. As if it wasn’t moving enough to see the enormous smiles of all the people Bpeace has reached, Bpeacers who were in on the secret stood up at the end of the video and danced their way to the stage, ramping up the excitement for the live auction to follow. Auctioneer Alan Kalter, the voice of the Late Show with David Letterman, teamed up with Jay O. Sanders, actor and Bpeace member, to auction a special Mother’s Day Greeting. They entertained the crowd all while raising funds for Bpeace. As with the entire evening, they demonstrated that here at Bpeace, work and fun need not be kept separate and that in fact something as simple as a job can make the elusive goal of happiness a reality. The most emotional part of the evening was the video profiling Gabriella Maldondo, one of Bpeace's Guatemalan Fast Runner entrepreneurs, who created a business producing pre-K educational materials, pioneering a new approach that involves not only toddlers and teachers, but families as well. Gaby's books, videos and teaching aids reach 40,000 Guatemalan children. She is on a mission to reach all of Guatemala's rural areas where most schools lack books. Creating jobs through better education for Guatemalan children from BpeaceHQ on Vimeo. Susan Arnot Heaney & Avon Products, Inc.